I truly don't know what's up with this. 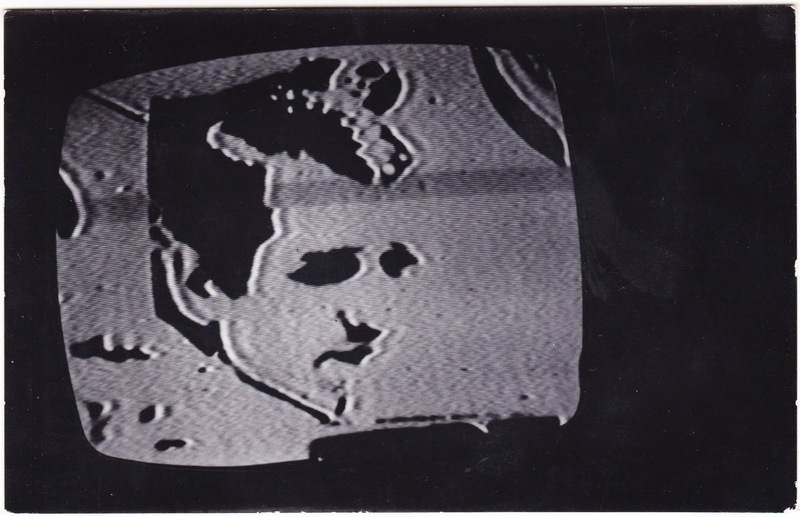 It's an old Kodak real photo postcard that seems to be a picture of face on a television screen. There is, of course, no writing on the back of the postcard. Because that would make things too easy. The design of the Kodak stamp box gives even less insight. The card is from sometime in 1950 or thereafter. If I had to take a crazy, wild guess, I would say the guy on the TV screen is Mitch Miller. But even if that's correct, that doesn't answer the "why" part of this postcard's existence. Did they want to show off their new TV to Aunt Eunice and Uncle Pekahiah? If so, why was the postcard never mailed? I can only dream of leaving a piece of ephemera that's this baffling for some future generation to ponder. Looks like too much hair for Mitch. Maybe Perry Como?